Babies are precious little beings that must be protected and kept safe until they are old enough to make their own decisions. Every parent wants to ensure their child is kept free from harm; harm of a physical nature, harm of an emotional nature and even harm of a health-related nature. Babies, unfortunately, are more susceptible to the multitude of viruses and parasites that can wreak havoc on the bodies’ immune system and cause long-term health problems. There is, however, a device that can help dispel viruses and dust from the air, removing the threat to your baby in record time. What is this device you may ask? Well, it’s a misting humidifier! 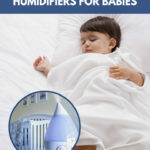 Humidifiers are not just a device that helps level out the humidity in your home and in the air but also a device that can prevent, along with treat, any new or existing health conditions.